Just Vegas has the popular Las Vegas theme and brings to the reels the glamour and glitter of Las Vegas. The buttons have a Vegas style neon signs like appearance. The Vegas Logo is the wild symbol and the Just Vegas Logo is the scatter symbol. The Male Player, the Female Player and the Tycoon with his personal jet in the background are high paying symbols. Other symbols include a wad of Cash and brightly colored high value card symbols. Just Vegas should be played with the audio enabled because it has peppy background music and vibrant win sounds. The animations in Just Vegas reflect the theme. The high value card symbols pulsate like neon signs with lights flashing in the background. The Vegas revelers too exhibit appropriate animation. The Tycoon juggles with wads of cash and the Female Player celebrates a big win. Just Vegas is an All Pays slot, which means that all 243 paylines are always enabled. All wins pay in any position from left to right on adjacent reels, beginning with the left most reel. The coin denomination range varies from 0.01 and goes to 20.00 with 31 stops thus providing a great deal of flexibility. The default wager is for 25 coins and the payouts are given in coins for 25 coins wagered. To convert to credits the payout has to be multiplied by the coin size selected. The Vegas Logo is the wild symbol. It appears on Reels 2, 3 and 4 only. It substitutes for all symbols except the scatter symbol. It does not act as a multiplier nor does it offer any line payouts. The Just Vegas Logo is the scatter symbol. 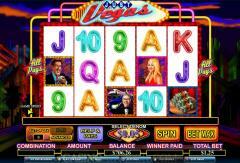 Three or more Just Vegas Logo symbols appearing anywhere on the reels offer scatter payouts and trigger the Just Vegas Casino Feature Bonus as well. This is a free spins feature in which players have to choose one from three packages of free spins. These packages are named as Asian Casino, Egyptian Casino and Roman Casino. The Asian Casino offers 10 free spins with a stacked wild on Reels 2, 3 and 4. 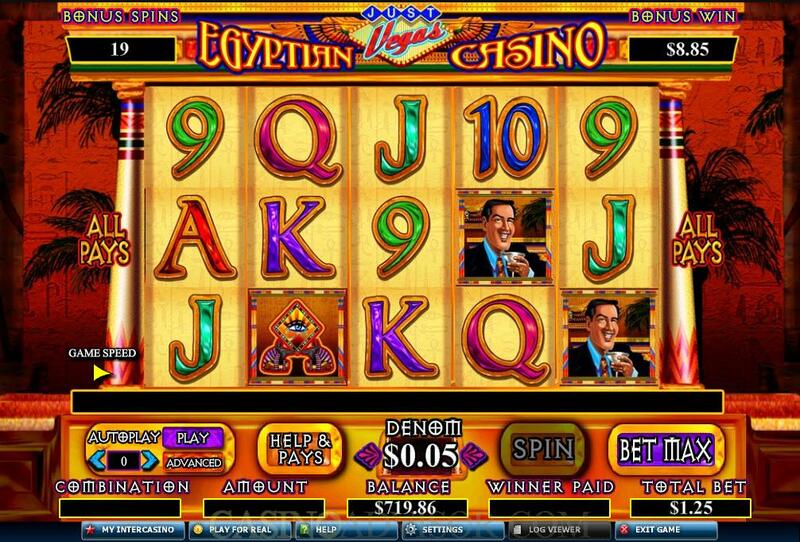 The free spins can be retriggered if three or more scatter symbols again appear on the reels. 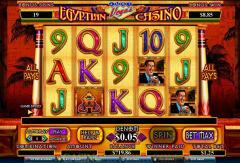 The Egyptian Casino offers 15 free spins with the Vegas Logo substituting even for the scattered Just Vegas Logo. The free spins can be retriggered if three or more scatter or wild symbols again appear on the reels. The Roman Casino offers 5 free spins with payouts multiplied 5 times. The free spins can be retriggered if three or more scatter symbols again appear on the reels. Just Vegas does not offer a bonus game on the second screen or a progressive jackpot. Interested in reading more detailed information about Just Vegas? If so Click Here for more details.